Provides UV protection for all finished automotive leather & vinyl. 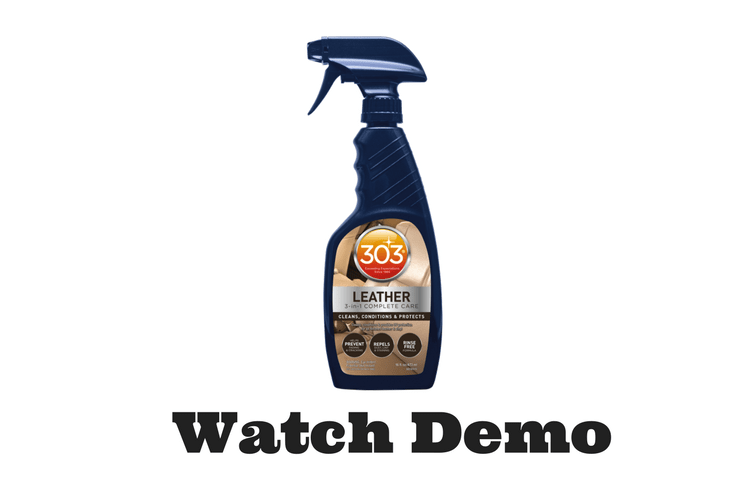 What is 303 ® Leather 3-in-1 Complete Care? 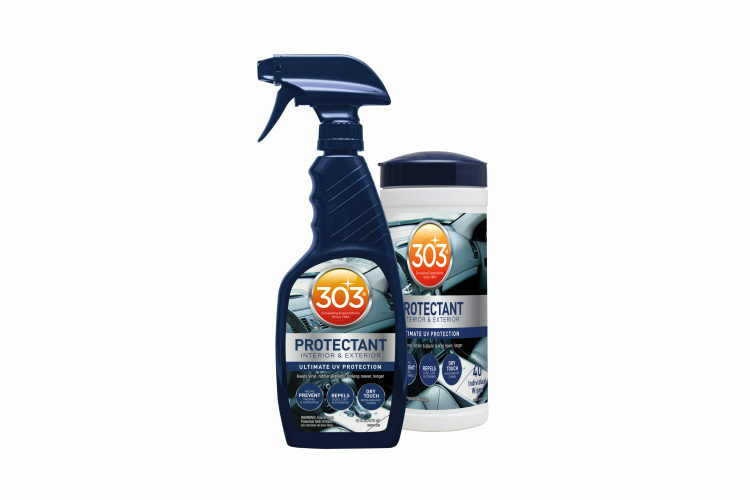 303® Leather 3-in-1 Complete Care cleans, conditions and provides UV protection to all finished leather and vinyl. It will help clean up surface dirt and grime, as will help repel future dust, lint and stains. It also contains superior UV protection to prevent fading and cracking of the leather caused by the sun’s harmful UV rays. Easy to use formula, just spray on and wipe off. 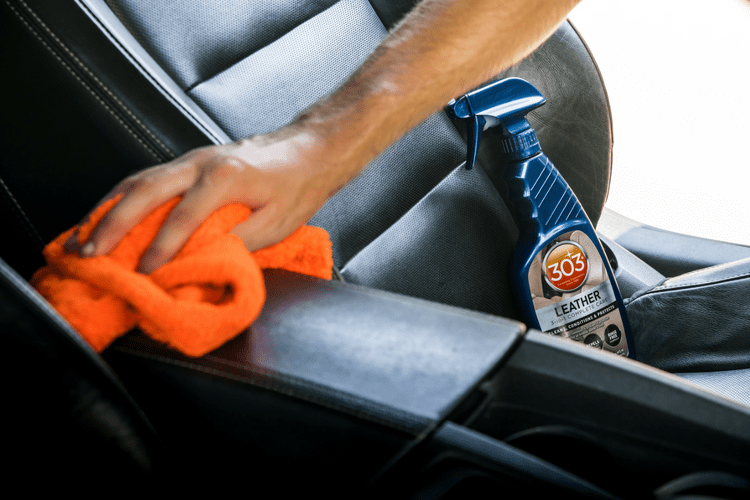 What surfaces can I use 303® Leather 3-in-1 Complete Care on? 303® Leather 3-in-1 Complete Care is safe and can be used on all finished leather and vinyl surfaces, including auto leather, leather shoes, and leather furniture. 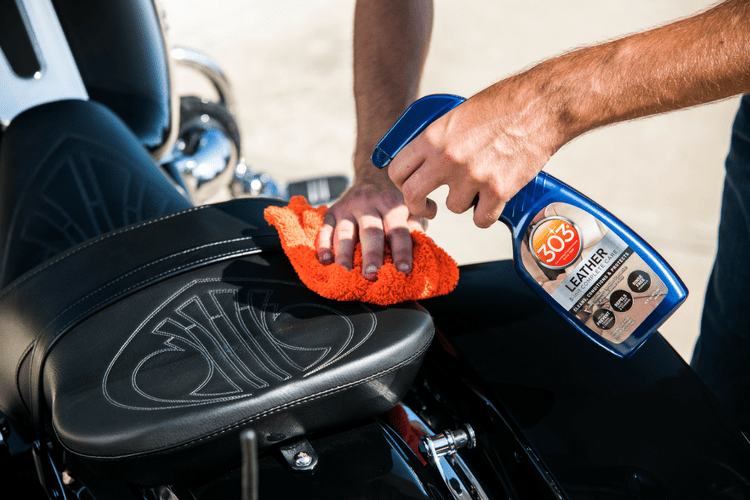 How often do I need to re-apply 303® Leather 3-in-1 Complete Care? 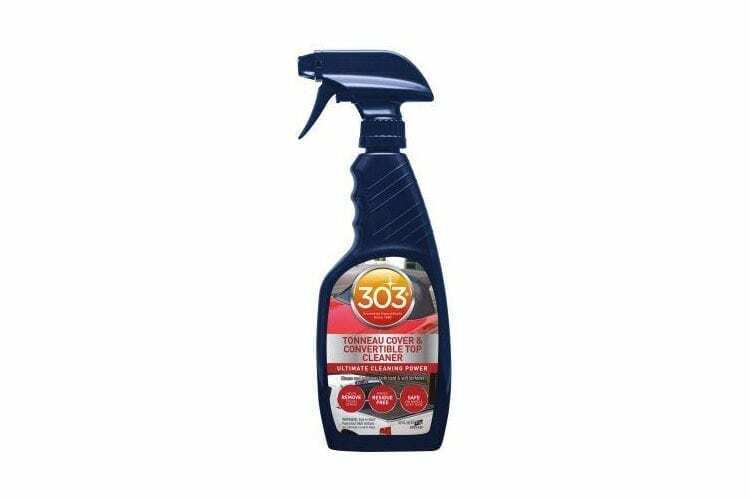 303® Automotive Leather 3-in-1 Complete Care is rated 4.6 out of 5 by 44. Rated 4 out of 5 by Stevay2005 from Easy on, not greasy, nice smell Nice that this product goes on easy with a choice between an integrated broad, narrow or off spray nozzle. Not greasy at all with a pleasant, light, not overwhelming smell, similar to the Caribbean - a bit of coconut perhaps? Two moderate reasons why I couldn't rate excellent: 1. It sprays on almost clear/milky white. On my beige leather interior, it's quite difficult to determine my coverage efficiency which probably led to over-application and wastefully wiping away product that the leather couldn't absorb due to saturation. 2. The shape of the bottle is optimized for store and garage shelves: tall and narrow. When the bottle is full and more top-heavy until much is used, the bottle requires a bit extra attention when you inevitably set it down in the interior. I didn't test if it leaked when down on its side, though a broader bottom would stabilize the bottle and eliminate this need for extra attention. Rated 5 out of 5 by cbblythe from Worked well on my car seat I have 3 tone interior, black white and blue. I was concerned about color fastness but the cleaner worked like a champ. It goes on easy, but it seemed a bit odd to remove excess with a wet cloth, and then dry. I followed the directions and it seemed to be fine. Rated 5 out of 5 by Jas5489 from Works Great I like this leather cleaner. It is not greasy like some I have bought. Works great on leather seats, vinyl and dashboards. Seems like I am getting less dust settling on the dash since I have started using 303. Has a pleasant fragrance too! Rated 4 out of 5 by lefty from Seat and trim Just tried the product on seats, trim and dash. Does a nice job cleaning. Does not leave the surface slippery nor is it glossy. I need to try it on seats that are more dirty to determine the real value, but still it appears to work well. Rated 5 out of 5 by SKMartin6 from Great results Great product, have black leather in my truck looks great after applying. I sprayed on a microfiber towel to apply, helps with over spray plus my seats are heated and a/c, so don't like to spray products on. Looks great, went on easy. Rated 3 out of 5 by Bob S from Easy to apply I thought that this product was easy to apply and wipe up. 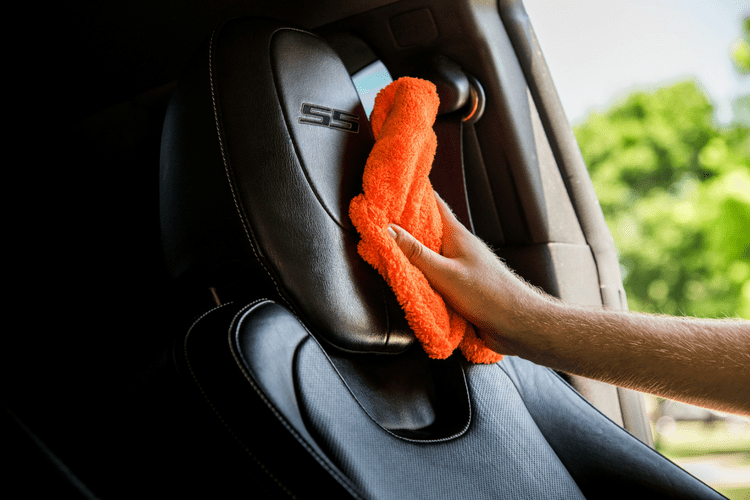 Since the leather in our cars is always clean, I was unable to tell how well it cleaned the upholstery. The leather did have a nice "gentle" sheen to it after I was done. Rated 5 out of 5 by nineback from Excellent Leather Cleaner/Conditioner This is a really nice leather cleaner and conditioner without any artificial smell. It leaves the leather with a natural leather smell. It is easy to apply and remove. It does not leave the leather oily or slippery. 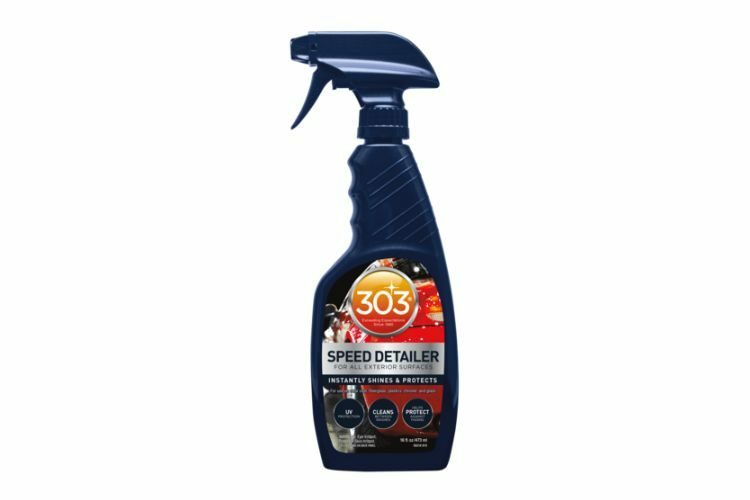 Rated 3 out of 5 by mazdastuff from 303 3 in 1 leather care I'm on the fence with this product. 3 in 1 is like having shampoo & conditioner. Sometimes it works out for you and other times not so much. I guess I prefer separate cleaner/conditioners. Rated 5 out of 5 by f15next from Great product, saves a lot of time Because this is a combined product, both leather cleaner, and preserver, it saves a lot of time, and the results are as good, if not better, then the others I have used. I'll buy again. Rated 5 out of 5 by pmontano from Quick and easy Too many cars I've owned with leather in the AZ heat start to get dry and coarse. 303 leather treatment is keeping my leather interior soft and protected from the harsh sun. Rated 4 out of 5 by Turner0923 from Great all in one product for leather Very satisfied, I have an 2004 MB SL500 that needed a little TLC, the 3-in1 cleaned, restored the leather with no residue or synthetic feel. I would definitely recommend. Rated 5 out of 5 by Dale from Exceeded expectations I used the product and found it to apply easily. It did not leave an oily or skippery feeling! The leather felt conditioned, clean and like new again. Rated 5 out of 5 by Pat S from Non Slippery product After applying this product for the first time I was amazed at how well it went on the surface. It was not slippery like other products I have tried. Rated 5 out of 5 by princetn1 from Easy and Not Greasy I tried this product on leather and vinyl and am very pleased with the results. Seems to lubricate with a high gloss shine for a long time. Rated 5 out of 5 by Shineworkz from Good leather maintainer. Excellent product for maintaining leather. Has a pleasant scent and is easy to use. Leaves behind a clean, protected, non greasy surface. Rated 5 out of 5 by BUDDY from leather looks new Used product on wife's car with leather interiors, did a great job, so I tried using on my 66 GTO which has vinyl, performed very well. Rated 5 out of 5 by HD GUY from Great Cleaner It cleaned my leather seats and dash well and didn't make them shiny. 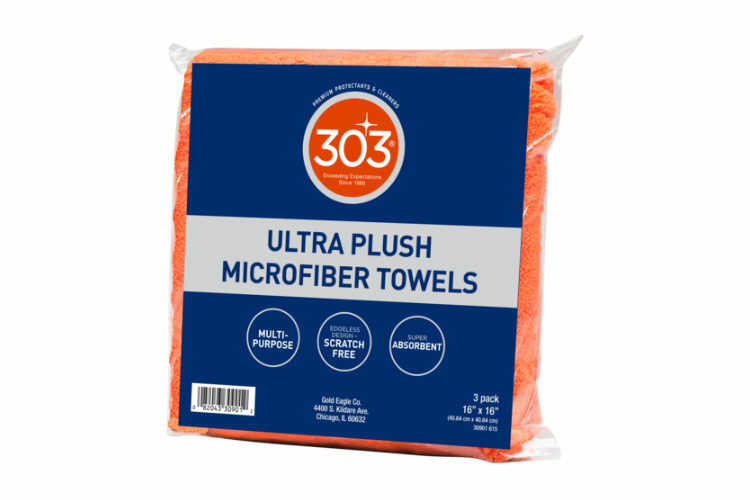 Like the rest of the 303 lineup, a great product. Rated 5 out of 5 by tommy from 3 in 1 wipes are really good i use them in my car on dash and leather seats...gets all stains off from my pants.. Rated 5 out of 5 by CraigD from Great for car and home I got this for the leather in my two cars but also tried it out on a couple leather jackets and it worked great. Rated 3 out of 5 by Copo2547 from Leather 3in1 Cleaned ok protects well and smells great. I had some black substance on the leather that took awhile to clean. Rated 5 out of 5 by Bill419 from Does the job! Used on my car's leather and my favorite leather chair. Cleans well and seems to work better time after time. Rated 5 out of 5 by sempercamino from 303 catches the eye. Excellent cleaner and protectant,also has a nice smell,not overpowering.I use it in the house,and the cars. Rated 2 out of 5 by Papa from Save your money I used this product to clean my leather recliner. A mild soap and water solution workso just as well. Rated 5 out of 5 by Porsche1 from Great Product Easy to use. Outstanding results. Application was quite simple with excellent results. Rated 5 out of 5 by curt from very good conditioner I have used this product and love it keeps the dust down on all interior pieces. Rated 5 out of 5 by JazzyDC from Great product Works as described. Easy to use and works great. Will def buy in the future. Rated 4 out of 5 by Joe J from Leather 3in1 Very impressed with the product !! Easy to apply , drys quickly .